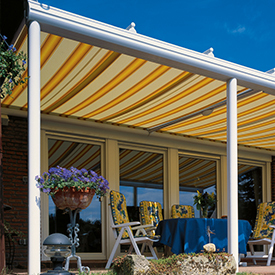 Samson Awnings Fixed Roof Structures are a form of small, medium or large weather canopy units suitable for a patio, terrace, balcony or garden area. The purchase of any fixed roof structure should be well thought out as many have different characteristics such as luxury transparent glass glazing, cost effective polycarbonate inserts, retractable covers, interaction with various awning products and more. With this in mind, you can find the fixed roof struction and accessories to best suit your needs. The fixed roof structure will always give you the very best protection from the UK weather and outperform any retractable system, but you can also add to most of the units items such as zip screens or glass sliding / bifolding doors in order to control the wind and rain even more underneath the structure. If you regularly spend time outdoors throughout the year then you will find that one of our high quality fixed roof structure are the ideal choice for you. It's liquid-impervious surface helps keep you dry so you can continue to entertain guests or relax in the garden in sun or rain. 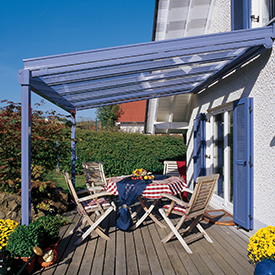 All of our terrace covers feature strongly constructed frames to prevent unsteadiness and ensure all-weather protection. A fixed roof structure can provide your life with a natural sense of luxury thanks to their inviting designs, constructed using aluminium with a choice of either polycarbonate or glass roofing. 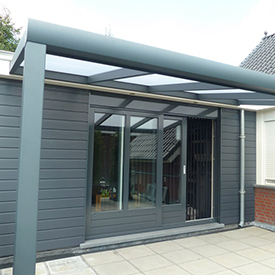 These structures usually have rain water guttering built in, along with the supply of optional extras available for infilling the sides and front as required with vertical blinds, zip screens and sliding glass doors. The installation of our Samson Piazza Patio Terrace Cover can transform your patio from an ordinary dull area into a vibrant all weather outdoor space suitable for entertaining the family and having BBQ’s. It ensures your patio furniture stays dry and is not ruined by the weather. Various side and front infills can make the weather protection greater if required, items such as vertical blinds, fixed panels and horizontal blinds. 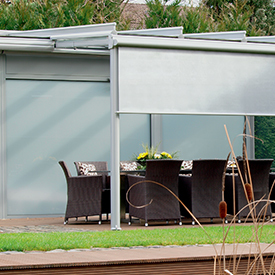 The Piazza is available with a triple polycarbonate or glass roof and the Stanza only in the polycarbonate roof. The Piazza has a greater number of roof support struts to enable the installation of glass where the Stanza has fewer and will provide more light underneath ultimately. Both are available in White, Brown, Green or Anthracite Grey as standard. It enables full use of the covered area most of the year round and incorporates a built in guttering system in the front profile to take the rain water away or even feed it in to a water barrel for use later on in the garden. The Piazza can be used during any season to protect your patio from sun, rain and even snow. A Piazza Patio Terrace Cover can provide your life with a natural sense of luxury and style through its pristine design, a favoured variety of roof tints and a wide selection of framework colour choices. Samson Doors offer 3 roof tints which have proven very popular with all of our customers. Tints are available in transparent polycarbonate, bronze polycarbonate or opaque polycarbonate (appearance similar to frosted glass). The glass option for the Piazza only is a laminated 8.8mm glass in clear as standard. The Terrazza is a purpose made aluminium and glass structure providing 365 days a year protection from the very diverse UK weather. It is a high quality German manufactured system with built in rainwater guttering in the front profile and sizes up to 10 metres wide and 7 metre projection with almost any shape also possible to accommodate most building shapes. 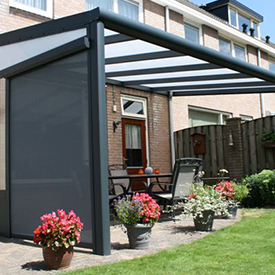 You have the option of heating, lighting, internal or external roof shading blinds, vertical blinds, sliding or folding glass doors and other accessories to enable blocking our one or all sides to the elements and create a room outdoors. During the summer months, the Weinor Terrazza can help your patio become an extension of your living, dining and entertaining space regardless of the weather. 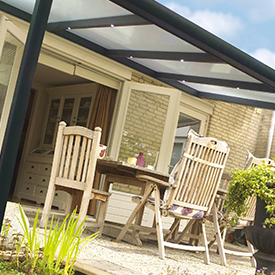 Anything from parties, barbecue’s to reading outside and simply enjoying what nature has to offer - the Terrazza can allow you to enjoy all of this with it’s solid & waterproof glass roof structure. Furthermore, expensive patio furniture can be left outside without fear of it getting wet. It really is the ultimate extension of your property! The glass-roof structure of the Terrazza allows you to transform your patio into an outdoor room which can be used in the spring, summer and autumn during both the night and day. The Terrazza makes possibilities endless and can not only enhance your quality of life, but also the valuation of your home. Planning permission is not normally required as the system does not require traditional footings like a conservatory does.